Tea & Books Saturday #5 - "The Afternoon Tea Cookbook"
A year or two ago, I was visiting my mom and she said "Oh, here's something I picked up for you at a yard sale. You've probably already got it, but it was just a quarter..." I was, of course, quite thrilled to see a tea book I'd not yet come across. And while I had glanced at the recipes before this week, not until I set about actually reading this book did I realize that it is really half-tea history and half-tea cookbook. It's a pretty pleasing combination, and I'm amazed at all the tea information the author included at a time when teatime had not really made its big comeback in this country! Early on in the book, Hewitt expressed her desire to see tea take a new direction: "The recent success of spiced and scented teas shows how ready the American tea fancier is to try something other than the blend of blacks that has come to dominate this market in the last fifty years. Perhaps green teas, which once accounted for much of the market and are now rarely seen at all in this country, will make a comeback." I would imagine she is quite pleased at the tea choices we have available today! 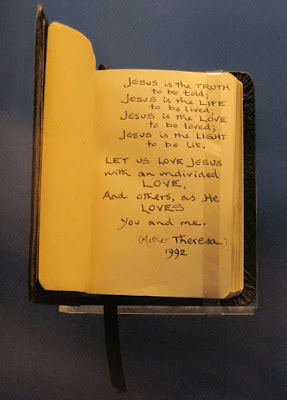 In the history part of the book, I was most impressed (to my great surprise!) with the chapter on the Japanese Tea Ceremony and the Shoguns. One shogun was so enamored of the tea experience, he rewarded his soldiers with gifts of tea artifacts rather than weapons! I have a much better appreciation, now, of the cha-no-yu ceremony and how everything about it is so meaningful to both host and guest. And while I'll probably stick to my preference for English style teatimes, I will definitely give more thought to using meaningful teawares, colors and food experiences for my guests. I also liked the chapter on "The English Aristocracy and Afternoon Tea," where I learned the name of the place where Anna, the Duchess of Bedford first took afternoon tea: Belvior Castle. 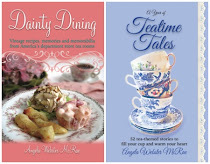 There is also an exhaustive (but not exhausting) chapter devoted to planning afternoon tea, and it alone would be a great primer for any newcomer to teatime. 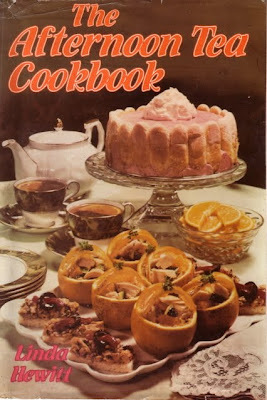 And then there are the recipes. This week I have already tried (and very much enjoyed) the Tuna Almond Sandwich recipe, and there are lots of Breads, Cakes, Confections, Cookies, Tarts, Tartlets and Pastries to explore as well. This book also includes an index that will be helpful when researching particular people/places/things related to tea. The history book/cookbook combination makes this book a unique one to add to your tea library -- and it's one of the best quarters my mother ever spent! You may have heard of "varmints" but have you heard of "VerMints," by any chance? 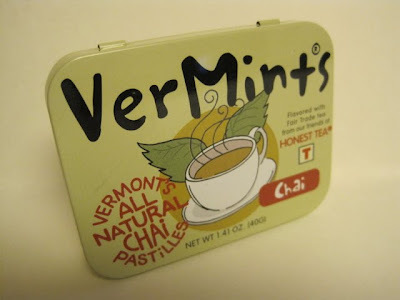 I came across these Vermont-made VerMints in a market in Florida in December and had to try them. The tin says they are "flavored with Fair Trade tea from our friends at Honest Tea." 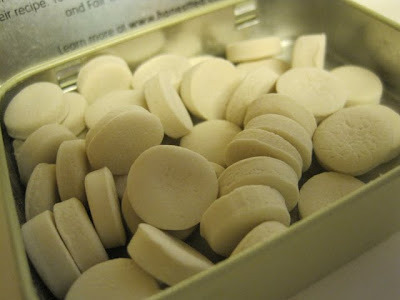 I really like the light, refreshing taste of these little mints! 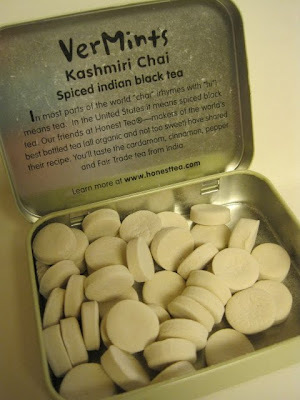 The inside of the tin tells you these Kashmiri Chai mints taste of cardamom, cinnamon, pepper and tea from India. And there is absolutely no reason for this last photo except that I thought the close-up made these mints look like a pile of tiny frozen scones! After I paid nearly $5 for my VerMints, I began to see them for less than half that at a T.J. Maxx or two, so be on the lookout if you're a fan of tea-flavored treats! We began the week looking at jewels from a princess, but today we're keeping it real and coming back down to earth a bit by touring the dollar bins at Michaels! These cute Mary Engelbreit lunch bags were part of my Christmas gift from a friend, and while I strongly suspect she paid full price, I bought five more packs of them on clearance for 5 for $1 a few days ago. Thank you, Mr. Clearance Bin! 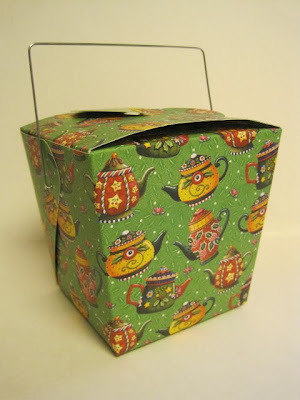 Another "Mary" treat I received from my friend was packaged in this adorable Chinese takeout container. Some of these were also on clearance at Michaels, but alas, none of the ones left had the teapot design. Still, you may want to look for these at *your* Michaels! Another gift from my friend? 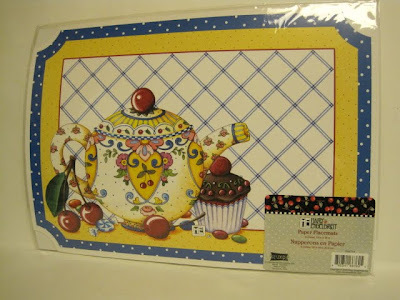 These adorable teapot placemats, which I'm thinking of turning into tea-themed file folders. Again, some of these were in the 20-cent clearance bin a few days ago. 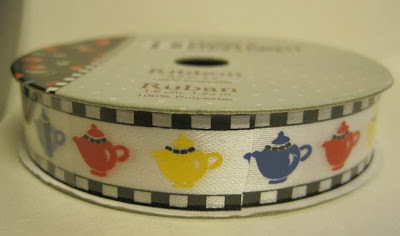 And finally ... this is a new product so it'll cost the entire dollar (for now), but I think this Mary Engelbreit teapot print ribbon is absolutely worth it! 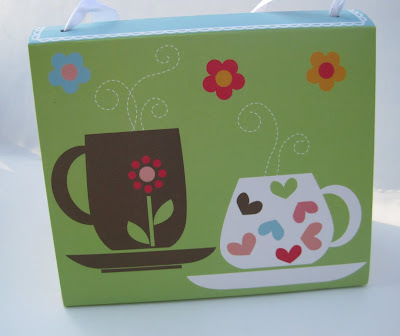 Has anyone found any more ME clearance items that are tea-themed? "The World in Your Teacup"
Now gift books of this type, while pretty, can be a bit on the shallow side when it comes to actual information. This one, however, is simply packed with tea information on various tea-drinking regions around the world and their particular tea habits. 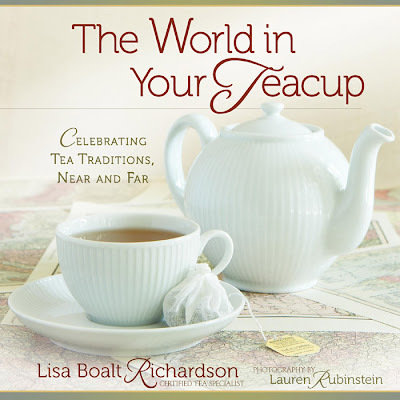 The book explores tea in China, England, Kenya, Russia, Iran (now that's different! ), France, Morocco and the good old U.S.A. I like how the book is organized, offering information on "Tea Past and Present" for each place as well as tips on recreating each culture's tea experience for yourself. Richardson has drawn from a wide group of friends for the recipes included with each chapter, and there are so many of them I'd like to try, including the Green Onion Crepes (China), Savory Honey Scones (Kenya), Noodle Babka (Russia) and Harira, a thick soup (Morocco). Richardson also gets points for including lots of tea history without making it seem dull or academic. She artfully weaves the background information into each section, and I didn't even realize until I completed the book that I'd actually gleaned quite a bit of tea history I'd not come across before. I had hoped to hear her speak at a tea event the other week but simply couldn't squeeze it into my calendar. Hopefully, I'll be able to arrange a face-to-face meeting with this fellow tea lover sometime this year, and meanwhile this book is a lovely substitute! 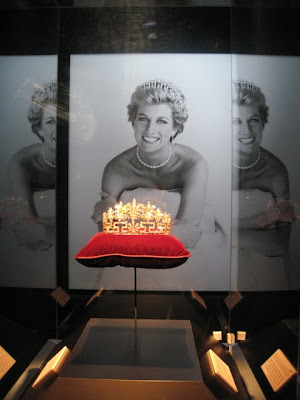 Getting to see the "Diana: A Celebration" exhibition was a wonderful treat, and tea lovers who visit can expect to find several lovely keepsakes available in the gift shop. 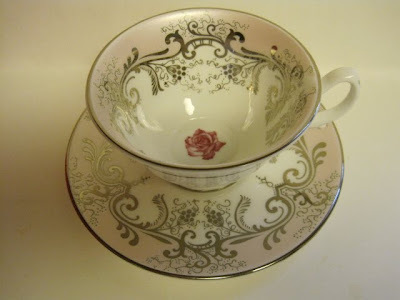 My favorite, by far, was this pink and platinum teacup and saucer. 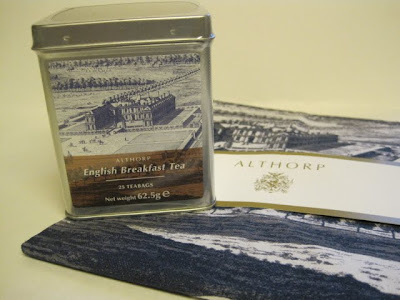 The lovely lady running the gift shop said I was her first customer and happily brought down a pretty pink box bearing the Althorp logo. 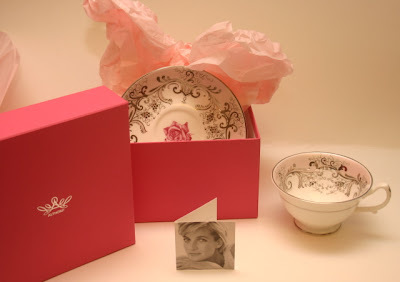 She pulled out a beautiful teacup and saucer with a pearlized pink finish accented by bands and flourishes of platinum and with pretty pink roses on the center of both cup and saucer. The minute I held it, I was a goner. 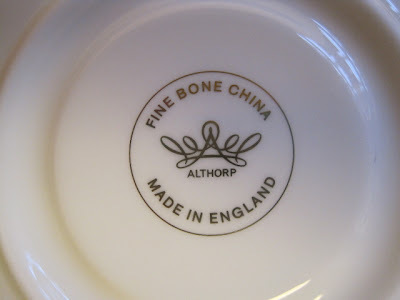 Happily, the teacup is actually made in England, unlike so many of the teawares I come across these days! 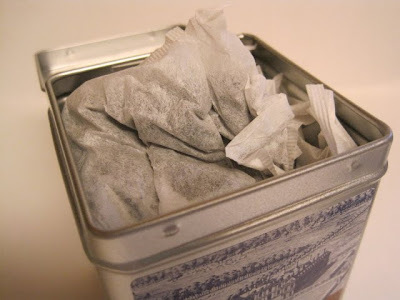 The stringless teabags were packed into the tin, reminding me of the PG Tips tea I have enjoyed on occasion. This beautiful tiara is the first item which greets visitors to "Diana: A Celebration," the exhibition now open at the Atlanta Civic Center. I was privileged to attend a media preview on Thursday, and I was thrilled to learn we could take our time and snap photos as we toured. Lord Charles Spencer, the late princess' brother, was supposed to be on hand but had been called unexpectedly to South Africa. I had been hoping to ask him if he's a fan of tea and if so what kind! 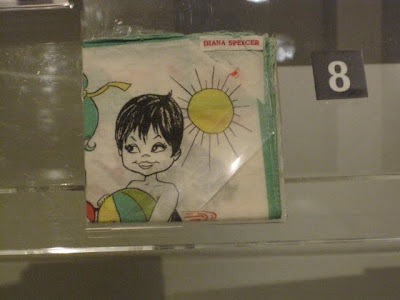 The exhibition is divided into various galleries exploring different facets of Diana's life. In the Spencer Women gallery, the pieces on display include this portrait by John Singer Sargent (!) of Lady Cynthia Eleanor Hamilton, Diana's paternal grandmother. Isn't the resemblance striking! 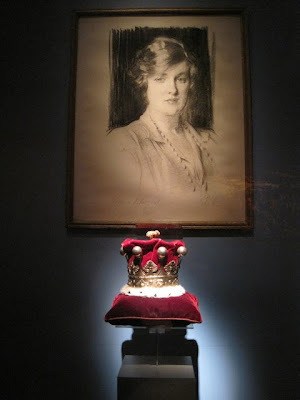 In front is a family coronet made by Sebastian Harry Garrard, "probably made to wear at the coronation of Edward VII." The incredible family jewels on display (and let me assure you the photos do not do them justice!) 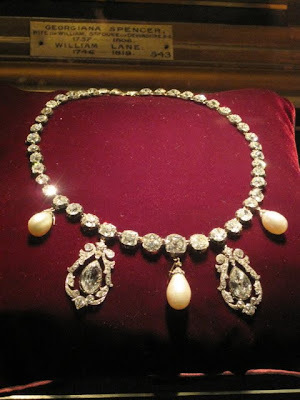 include the pearl and diamond necklace above. The two diamond drops are from a pair of earrings. 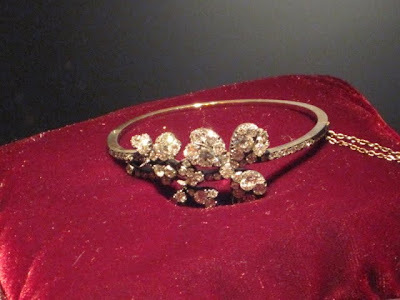 The antique diamond shamrock bangle bracelet was a gift from Queen Alexandra to Charlotte, 5th Countess Spencer. 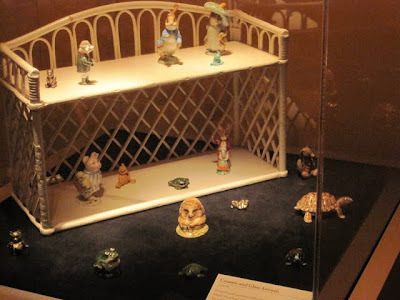 In the gallery on Diana's Childhood, these ceramic and glass figurines from her collection (1970-1990) were on display. I found it touching that the rabbit up top was missing an ear. 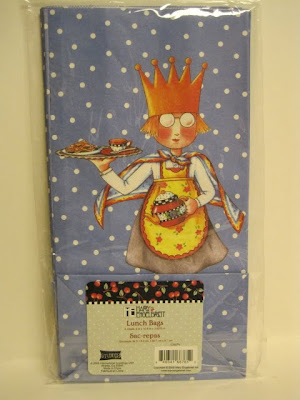 Now most visitors probably wouldn't care about this, but I just thought fellow tea lovers might want to see a hankie that belonged to the princess during her schoolgirl days, sewn with the same sort of personalized labels many of us can remember. 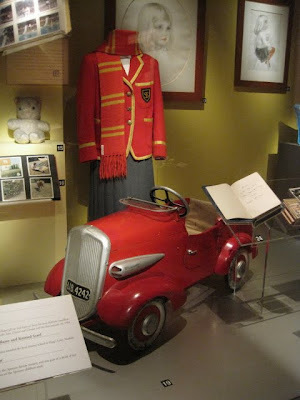 This was Diana's nursery school uniform from 1968, displayed behind a 1950s toy car from the Spencer family nursery. 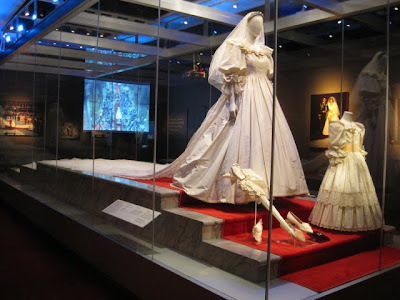 And finally, the moment I'd really been waiting for, the Royal Wedding gallery and the world's most famous wedding gown! 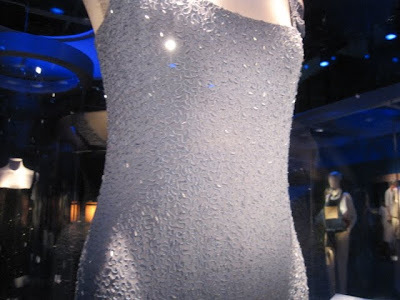 I literally gasped when I first came upon that gown. To say it is breathtaking is no exaggeration! Remember those pretty ruffled sleeves? I will never, ever forget watching the Royal Wedding with a spend-the-night girlfriend when I was a teenage girl. 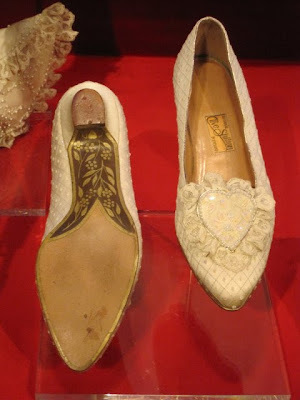 After viewing the festivities, all day long we giggled and relived that beautiful ceremony and Diana's sweet flubbing of Charles' name ("Philip Charles Arthur George" instead of "Charles Philip Arthur George"). The exhibition is really beautifully designed so that visitors can get "up close and personal" with these pieces without the temptation to touch them. 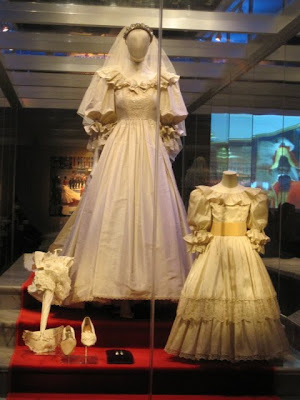 Looking through the glass case, you hear wonderfully majestic music and view footage of the wedding playing on TV screens in the background. 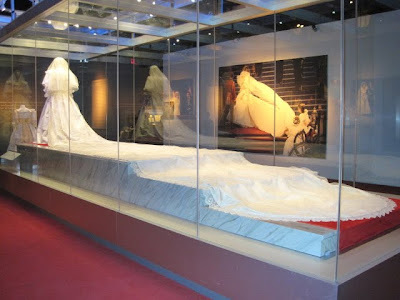 In the second photo, note how the display of the gown's 25-foot train is perfectly aligned with the photo of the dress and train on the wedding day. Beautiful! 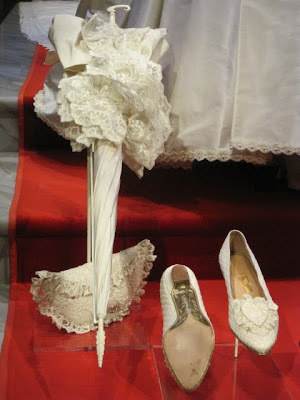 This silk and lace parasol was made to match the wedding gown in the event of rain but was never used. 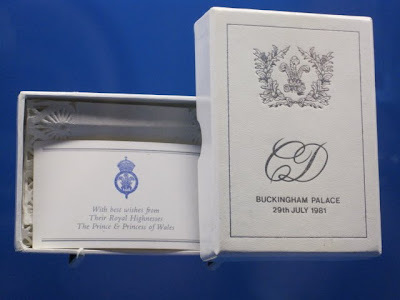 This monogrammed cake box was given to guests for their souvenir cake slice from the wedding. That appears to be a pretty paper lace doily at far left. 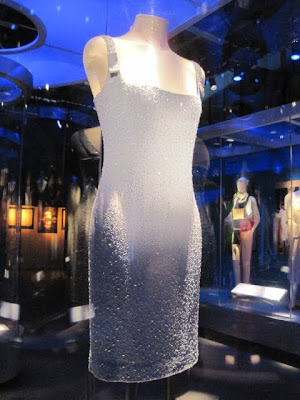 And another wow-inducing moment occurs when you enter the gallery of dresses Diana wore. 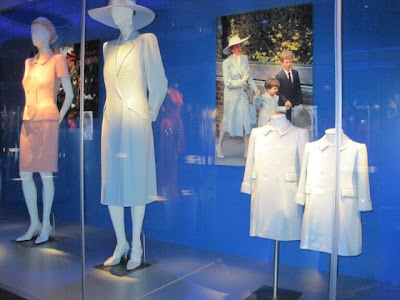 I loved seeing Diana's pretty blue coat along with the matching coats made for William and Harry. 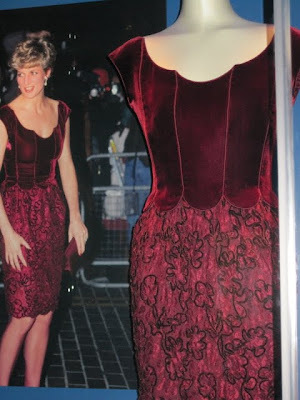 This burgundy velvet cocktail dress is one I don't ever remember seeing but it was definitely one of my favorites because of the lush color and fabric. 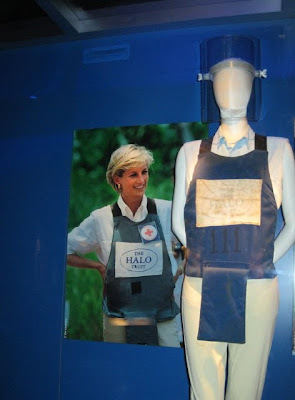 But perhaps the outfit I admired most was this one, from the time Diana went to Angola with the British Red Cross to bring attention to the problem of land mines. I remember being so impressed she would risk life and limb for a cause she so believed in, and I am happy that her charitable work remains a major part of her legacy. If you want to see this exhibit for yourself, and I hope you will, it will be at the Atlanta Civic Center through June 13 and you can find more info here. And you know how I said there would be tea? Well, there is, in the exhibition gift shop, but I've prattled on so much today let's save that for tomorrow! Tea and Books Saturday #4 - "Talking of Tea"
What a delightful book! Gervas Huxley was the grandson of biologist Thomas Henry Huxley and cousin of novelist Aldous Huxley. He served in WWI before beginning his 30-year career of marketing tea. In his sixties he wrote this, his first book, and it has all the passion and wit of a Brit who truly knows and loves this beverage. I've read probably a half dozen or so "tea history" books in the past year, but this small (104-page) volume is the one I'd recommend as a great guide for both beginning and longtime tea enthusiasts. Whether Huxley is writing of tea's discovery or of the great days of tea trade on the high seas, he tells the story and simply gets on with it. The reader is always left wanting more, not less, and you can easily zip through the short chapters. I love to read a tea book and discover something I never knew before. That happened often with this book. I did not know that when tea was first sold in retail stores, customers were supposed to bring their own packaging for it. 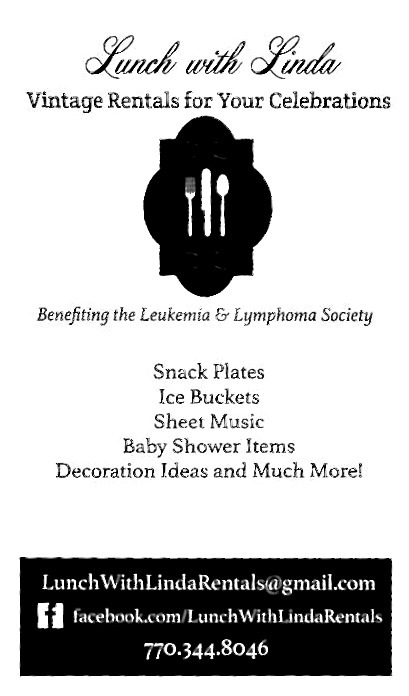 Can you imagine having to bring your own tin or box to the store today? (Actually, that wouldn't be a bad idea, just one that seems a little odd!) I also did not know that Sir Thomas Lipton's shops were originally famous for their hams and cheeses and he didn't trade in tea until he was 40. I especially loved this bit from Huxley: "Once, on a voyage to Ceylon, Lipton's ship ran ashore in the Red Sea and some of the cargo had to be thrown overboard. While the other passengers were making for the lifeboats, Lipton was busy stencilling 'Drink Lipton's Tea' on such of the cargo as would be likely to float." 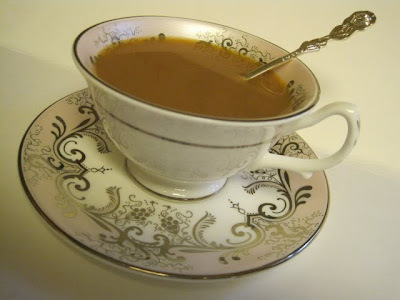 We also learn that tea was, in its early days, sold in apothecaries; that tea in milk was a purely medicinal concoction at first; and that at the time this book was written American teabags were "considerably more expensive" than loose leaf tea. 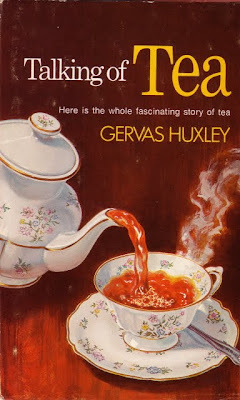 And though there is much to amuse and entertain in this book, I think my favorite Huxley wisdom is summed up here: "Tea is clearly a most accommodating substance. What amongst so many ways of drinking tea, is the 'right' way? ... Since so many different people are convinced their way is the right way, there can be only one answer to the question. The right way to drink tea is the way you like it best. To this answer must, however, be added an important proviso. 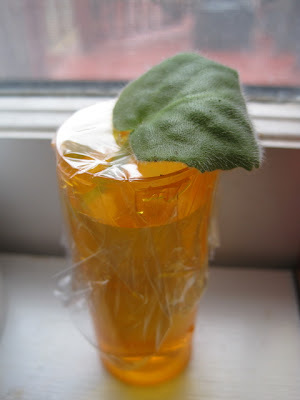 In whatever way you take your tea, the leaf should have been given the chance of bringing out its full nature and flavour." Copies of this book can be found inexpensively at the usual sources (eBay or Amazon, which currently has 21 of them starting at just $1), and I highly recommend this delicious little book! 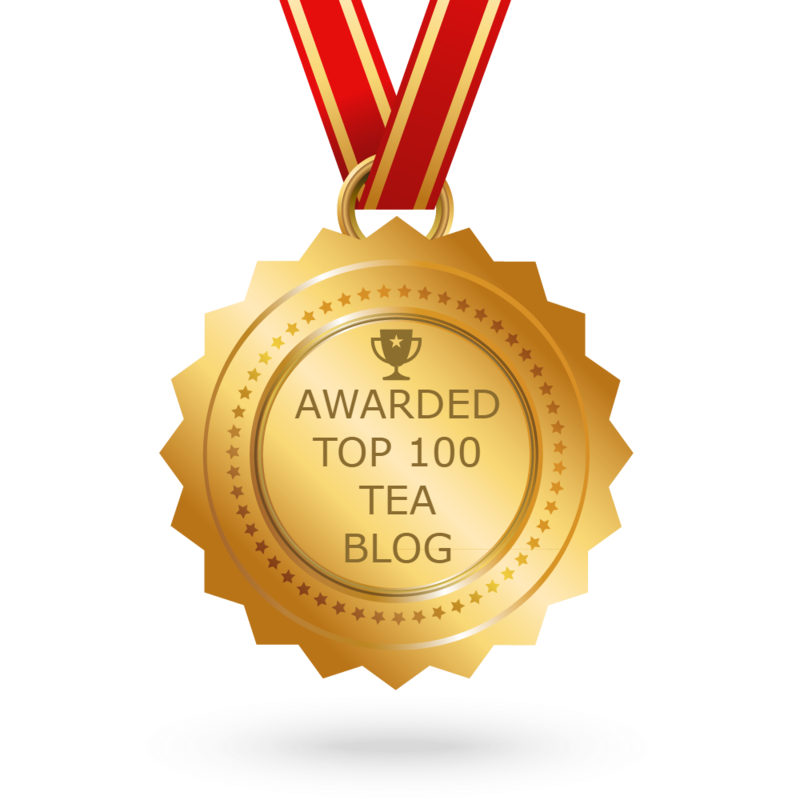 NOTE TO GWENDOL: It's now possible for you to read any of the "Tea Tasting Saturday" posts from last year just by clicking on the link at right under "Labels." Similarly, this year's "Tea and Books Saturday" posts will all be organized together as well. I hope that is what you were looking for! Our giveaway winner is Susan (who currently has a pretty teapot featured on her Chipmunkits blog), who commented on Thursday and said she has been a member of the African Violet Society since 1971. 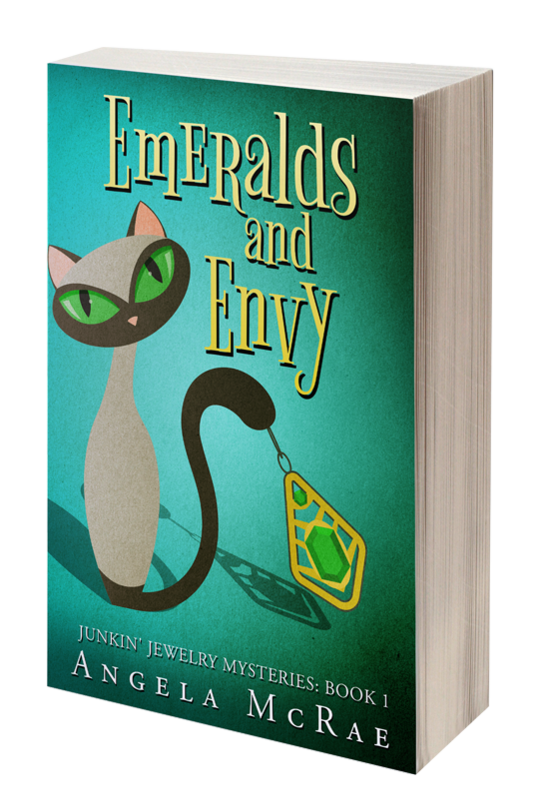 Congratulations Susan, and if you'll send your snail mail address to angelamcrae@charter.net I'll get your package in the mail to you! It was so much fun to "meet" new tea friends this week and hear from some of you who don't always comment. I especially chuckled over the one (you know who you are!) who said you'd always thought I wouldn't give "a soggy sugar cube" what you thought about things. Oh, but I do, I do! We'll have to do more of these giveaways again soon. I think around Valentine's Day would be nice, don't you? 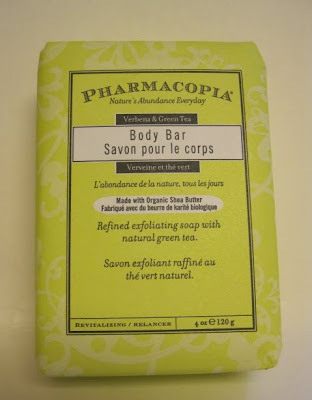 You know that bar of Pharmacopia Verbena & Green Tea Soap that's part of the giveaway I'll be giving away later today? I actually bought one of these for myself as well when I was at a HomeGoods store last week. I think $1.99 is a pretty good price for "fancy" soap but especially for soap with green tea. I also like the "old time pharmaceutical" look of the packaging. But when I opened my soap, I thought oh my goodness, I've bought discolored soap and even offered to give some away. Uh-oh. Then I put on my reading glasses and examined those little dark spots a bit closer. Hmmm. They really do appear to be brown bits of something, not discolored soap after all. What on earth? Well, first of all, I clearly ignored the front of the package where it said "exfoliating soap," which should have been my first clue. 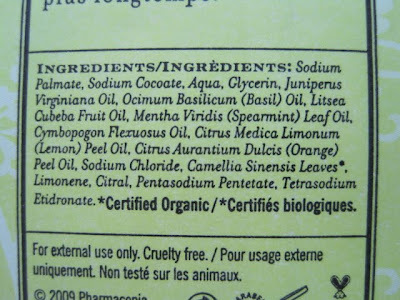 If you read the ingredient panel -- which I never seem to do until after I've bought something -- you find that camellia sinensis leaves (tea leaves!) are the mystery ingredient. Now that's a first! 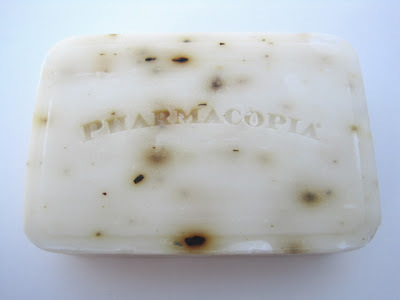 Relieved at finding out the reason for the brown spots, I happily used my new soap with the lovely verbena scent. Meanwhile, I'll be eagerly counting the week's comments this afternoon and posting the name of the giveaway winner later in the day. Good luck! 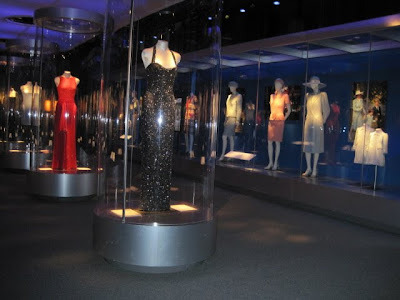 AND COMING MONDAY: Yesterday I had the privilege of attending the media preview for the new Princess Diana exhibit opening this weekend at the Atlanta Civic Center. 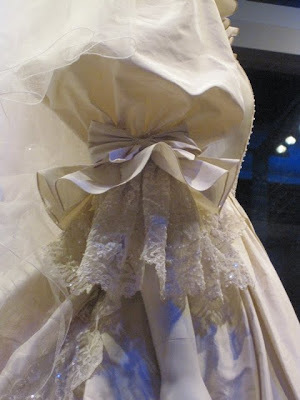 I took 200+ photos (oh, that wedding gown!) and need a little time to go through them. So if you'll join me next week I'll share some of the many sights I saw -- and yes, there will be tea! 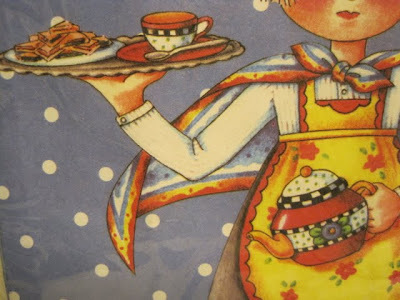 If you don't mind my being nosy, where do you stand on collecting orphaned teacups? For most of my life, I have been firmly against them. 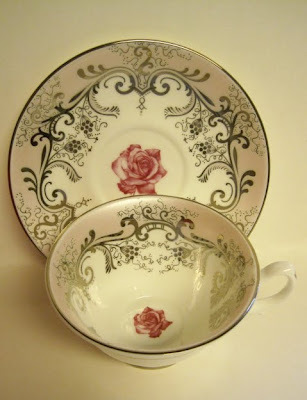 We tea lovers have a hard enough time finding places for all our teacup-and-saucer sets and teapots without adding a pile of singleton teacups to the mix. But ... this one was so beautiful! It was $3 at What's in Store, the wonderful little thrift store near my office. 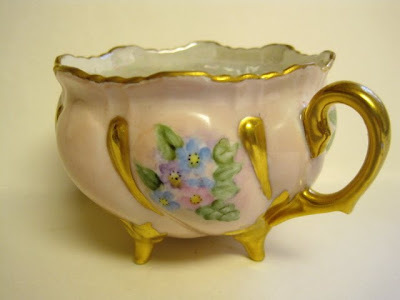 I bought this teacup last year not knowing quite what I'd do with it, one of those rare too-pretty-to-leave-it items. 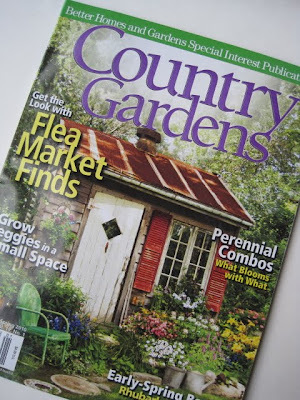 And then I came across the wonderful article "Alluring African Violets" in the new issue of Country Gardens magazine. Is that not just the loveliest display of violets you've ever seen? 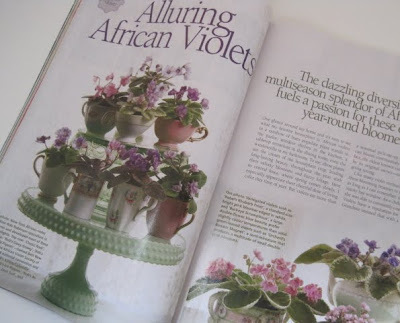 The African violets in the article are mostly miniatures, but what a great way to use those pretty orphaned teacups. 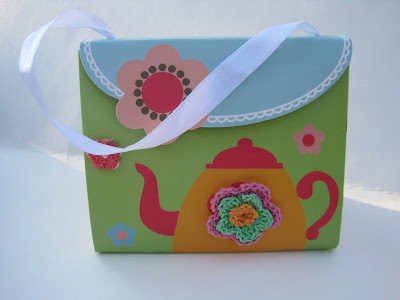 A purse full of tea! My friend Kathy in Savannah was so apologetic when we met a few days before Christmas. She had failed to locate a too-well-hidden gift of mine and would have to mail it instead. Frankly, I am always pleased to get gifts *after* Christmas because it makes the celebration last even longer. One look and I knew that whatever was in this tiny little cardboard purse, I was going to enjoy it! 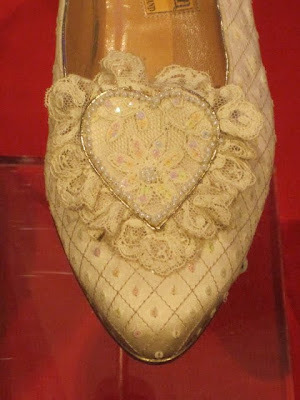 And I love the little crocheted flower detail! Even the back of this little container has teacups on it. Sweet! But inside was an even sweeter treat: teas, sugars and delicious candies from the Hale Tea Company in Richmond Hill near Savannah. I've now had all three teas and must say I enjoyed them all: Black Tea with Raspberry, Rooibos Rising Sun and Rooibos Pina Colada. 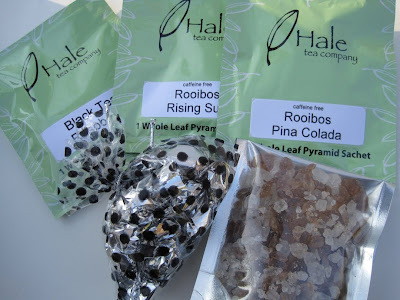 Are any of you familiar with Hale Tea Company and their offerings? If so, I'd love to hear what you recommend! Tea & Books Saturday #3 - "Teapots"